Detained Ethiopians in Japan Released from Custody! We have just heard some very good news; the Japanese government has now released the last of the 17 known Ethiopian asylum-seekers being detained at Japanese Immigration Detention Centers in Japan—some of whom were being held for over two and a half years! 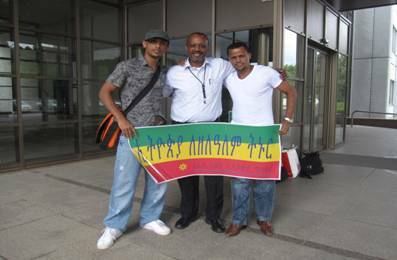 In fact, one of the officials from the Japanese Minister of Justice’s Office, with whom Ethiopian community leaders in Japan and I had met in May, contacted me on August 31, 2010; personally informing me that all the Ethiopians being held in detention have now been released! In a world where many governments often do not respond with such quick action, I highly commend the office of the Japanese Minister of Justice for their attention to this matter. The credit also goes to the Ethiopian community and its leaders in Japan for their efforts on behalf of these detainees; all of whom were thrilled with the release of their family members, friends and fellow community members. It was only four months ago when they had made arrangements for me to go there to help address this and other issues facing Ethiopians in that country. During my time there, some of us had visited six of the Ethiopians being held in Mho-Shi Ushiku Immigration Detention Center, located 100 miles outside of Toyko. I clearly remember how emotionally moved I was during individual interviews as each of the six pressed his hand to mine; separated into different worlds only by the glass. We all had tears in our eyes as they told me of the hardship on the inside and how they felt so abandoned by the outside world. Now, they and others are all free and I thank God for this. This is the first of a two-part report on the trip I made to Japan. As I thanked the Japanese official for their good efforts in bringing about their release, I told her that it was a very significant first step; explaining that I hoped that similar action would follow in regards to improving some of the other gaps in refugee assimilation in Japan due to the many difficulties they faced in the country. I specifically asked for assistance from their office in either taking action to grant Ethiopians asylum so they would have more opportunity to live normal lives within Japan; or if not, to allow them to immigrate to another country where they could seek asylum. 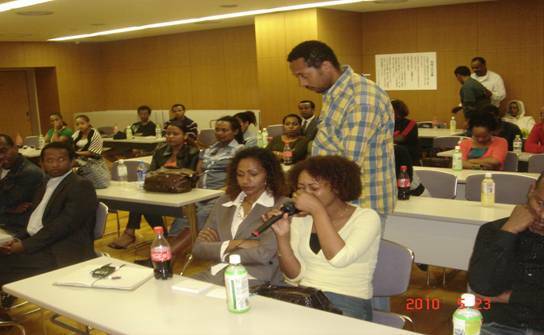 Currently, Ethiopians face nearly insurmountable obstacles to gaining permanent refugee status; even for Ethiopians living in Japan for as long as sixteen years. 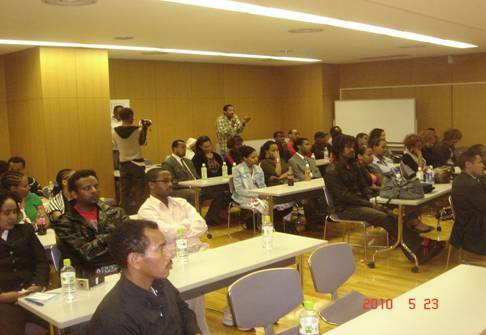 These people came to the country for other reasons—like a workshop, as marathon runners or a conference and then sought asylum due to human rights violations, persecution and lack of freedom and opportunity in Ethiopia; however, Japan is known to have more restrictions on being accepted as a refugee than most any other developed country. Reportedly, since 1986, over 3,500 people have applied for refugee status and only 100 or fewer have been accepted. Without the right documents as asylum seekers—which must be renewed every three months at a cost to them of approximately $50, one cannot obtain working papers enabling these people to work. It is also difficult to obtain housing since you must have a working permit, a job and have a Japanese citizen co-sign for you. To go to school, you also must have the proper document as well as know the language. Movement within the country is also difficult because those who cannot afford the paper renewal fees are afraid to use public transportation as this is where authorities often check their papers; resulting in arrests and detentions. While I was there, I asked for an Ethiopian community meeting; not for me to give a speech, but instead, for me to meet other Ethiopians and to better understand the challenges they faced. Many who shared were younger Ethiopians, under the age of 45, who should have been in their most productive years; but yet, because of their non-status, they were unable to do anything. One Ethiopian journalist Ato Yohnnes Alemayehu stated, “Our future is being wasted away. I have been here for over three years and I am not working or going to school. Instead, I am spending the whole day doing nothing and I am not sure how long this will continue.” A seventeen-year-old young man shared how he lived in constant fear of being taken into detention; saying, he would rather die than end up there. After she then proceeded to finish her story, another woman shared her experience of repeated detentions resulting from her ongoing difficulties in getting her papers renewed. She told how she had become sick during her detention and had been unable to get medication. Instead, she had been given sleeping pills rather than treatment. Another lady shared a similar testimony about a long detention in jail; where she also had become sick and had been given a medication that she had negatively reacted to; causing her to pass out. Because she could not read the language, she still does not know what it was. She went on to speak of being taken by authorities to the airport for deportation, which only was avoided when she was given the opportunity to call a Japanese official she knew who was connected to the government. This person successfully advocated for her; but to date, she still has been unable to obtain her papers. A man then spoke of trying to obtain the $2,000 (US) needed for bail in order to obtain his wife’s release from jail—an impossible amount for him; however, he finally found the funds from friends abroad. Another man explained that his wife had become pregnant and that the cost of a delivery was nearly $5,000 (US); an amount he did not have. They were told that pregnancy was not considered a health problem. We later went together to talk to the Japanese Refugee Association and they agreed to cover it. The child is now born and the costs were covered. Another man explained that both he and his wife had been journalists in Ethiopia, a country known for having one of the worst records in Africa for the repression of journalists; however, they had encountered difficulty obtaining asylum. At one point, his wife had been picked up and taken into detention where she had become ill. Although she had finally been released, he cried as he explained his frustration in not being able to do anything to help her. Following this meeting some of us met with Japanese officials at the Minister of Justice Office, at the United Nations High Commission for Refugees in Japan (UNHCR), Amnesty International-Japan, the Japanese Refugee Association (JAR) and I was interviewed by two leading Japanese newspapers—the Asahi Shimbun, Japan’s leading newspaper and Mainichi Newspaper. Yet, there is still much more to do and the pain I felt for them remains with me; pushing me to search for answers, which leads to the simple question—why are we Ethiopians not doing more to help? However, that leads to the root question of why Ethiopia remains such an inhospitable place for its own citizens that our people are being scattered among the nations of the world where many end up suffering. Ethiopians end up dying in places like Saudi Arabia; where recently, five Ethiopian detainees died of suffocation due to overcrowded conditions in a Saudi detention center where they were being held, ready for deportation. Others seeking a better life end up being sexually trafficked or in domestic jobs in the Middle East where so many of our people have been forced into servile labor with some even being killed or raped. Some have been shot by Egyptian border police while trying to escape from Egypt to Israel while others die as they try to cross the deserts in their efforts to reach a safe haven. Others languish in detention centers in Libya where they are also mistreated. In Tanzania, some are rounded up and placed in detention centers while trying to reach South Africa. Many from the Ogaden are dying as they try to run away from the ongoing Meles-led genocide going on in the Ogaden region of southeastern Ethiopia. In Kenya, other Ethiopians are rounded up by Kenyan authorities for not having the proper documents. Some of my own ethnic group—the Anuak—are dying in Sudan; living in exile ever since the massacre of December 13, 2003 in Gambella by their own government who is supposed to protect them. This is all in addition to the many Oromo and others that drown in the Red Sea as they try to reach Yemen; while some of those who do, can be deported back to Ethiopia and face execution, imprisonment or simply disappear. Our people are dying trying to run away from our home. This is going on as we speak. Over the past few days, I communicated with nine Ethiopians on Facebook; all of whom were determined to leave the country due to the terrible conditions. I don’t blame them because the future looks so grim—just look at the new law in Ethiopia that requires the closing of all distance education programs and degrees in law and education—but if people do not rise up and resist from within, how can change ever come? If people do not demand it, Meles and his TPLF government will never offer it! It will not come without much work and sacrifice! Even the TPLF, who are trying to sustain control by dividing and repressing the people, have only done so by working very hard; even if it is for all the wrong reasons. We cannot succeed in making Ethiopia a better place without taking action ourselves or by supporting those who are working from both inside and outside of Ethiopia. A recent study put Ethiopia at the top in terms of how many of its people would choose to migrate if they could—a total of 46%! How many Japanese are seeking safe haven elsewhere? When I was in Japan, I was so impressed, even with the city of Tokyo, where millions of people live. It was one of the most clean and beautiful cities I have ever seen and I was struck with the impression that the country appears to have a government that really cares for their own people; however, in Ethiopia, we have had a series of governments that seem to only care about maintaining their own power and providing benefits to themselves and their cronies. The future of a New Ethiopia is in the collective hands of Ethiopians. To wish for change and to not be willing to step forward in action makes us partners in prolonging our own oppression. Giving up is not an option! Instead, let us hold tightly to our vision for a New Ethiopia, trusting in God to guide and empower us in our battle for a healthier, more harmonious and more caring society, especially to the most vulnerable—our children, women, elders, disabled, the poor, the weak and the marginalized! The next report will cover what happened after. A Poll conducted by Gallup in 148 countries including Ethiopia, reveals an interesting insight to what could happen if migration of all adults worldwide who desire to migrate permanently to other countries actually moved where they wanted today. Not surprisingly, Ethiopia would be a net loser and could see its population almost cut by half, if everyone who wants to run away from Ethiopia could. According to the survey, Ethiopia has one of the highest negative Potential Net Migration Index (PNMI) of 46%. Comoros, Somaliland, Liberia, El Salvador, Ethiopia, Nigeria, Zimbabwe, Haiti, and Sierra Leone are all at the bottom of the list.